Origin Open woodlands and rocky hillsides in southern Europe, northern Africa and western Asia. 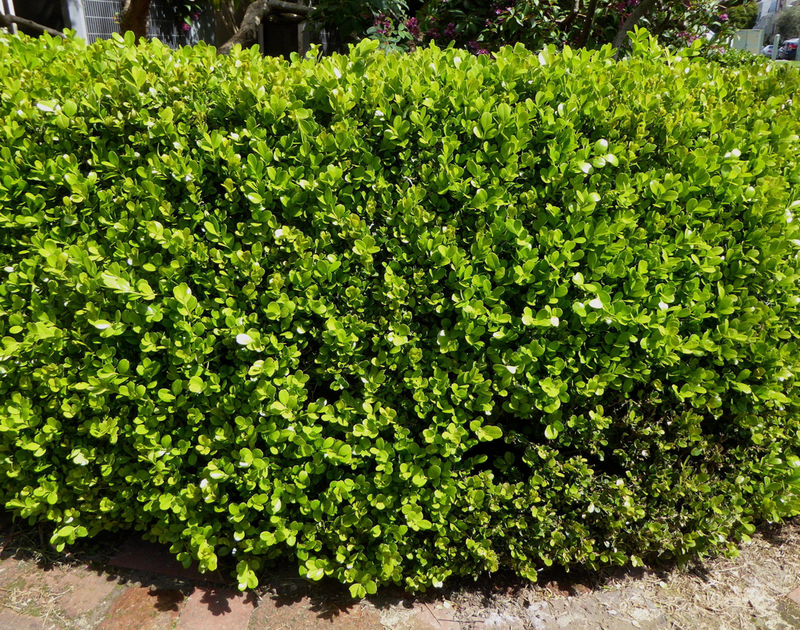 Boxwood scientifically known as Buxus sempervirens is a rounded to broad-rounded shrub or small tree that belongs to the family Buxacece, a very small family of only six genera and about thirty species, closely related to the Spurge family – Euphorbiaceae. Only this evergreen species has been utilized in medicine. Apart from boxwood it is also known as Caucasian boxwood, European box, French boxwood, Persian boxwood, Turkish boxwood, box, boxtree, boxwood, boxwoodtree, common box, common boxwood, English Boxwood. The plant is native to open woodlands and rocky hillsides in southern Europe, northern Africa and western Asia. It is the aristocrat of formal gardens. 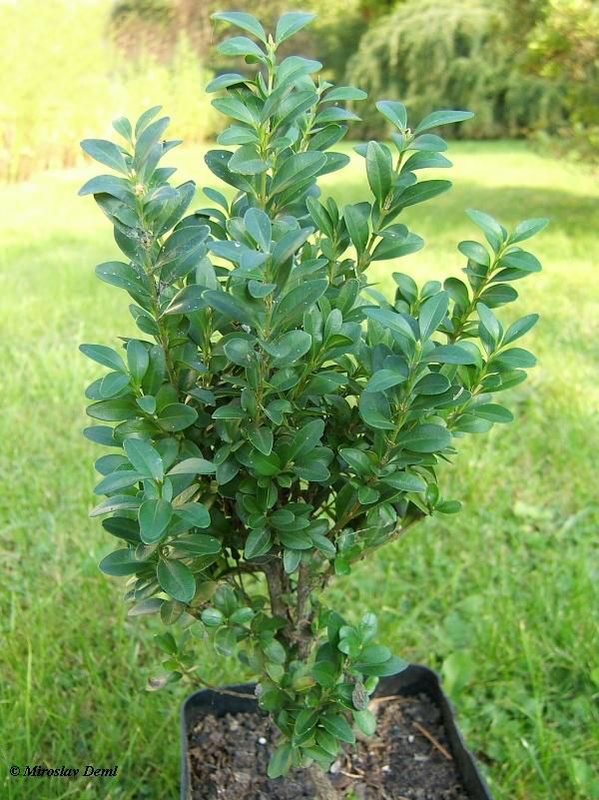 Dwarf varieties, known as English boxwood are extensively used as edging, hedges and foundation plants. The larger varieties, known as American boxwood, are used as screens, foundation and formal plantings. Boxwood is a rounded to broad-rounded shrub or small tree that can grow to about 12 to 15 feet in height, rarely exceeding 20 feet when left undisturbed or uncut. Boxwood performs best in partial shade but will tolerate full sun. Soils must be well drained, organic, slightly acid to neutral pH and fertile. The plant has a dense root system, which forms a net of thin, yellow roots. 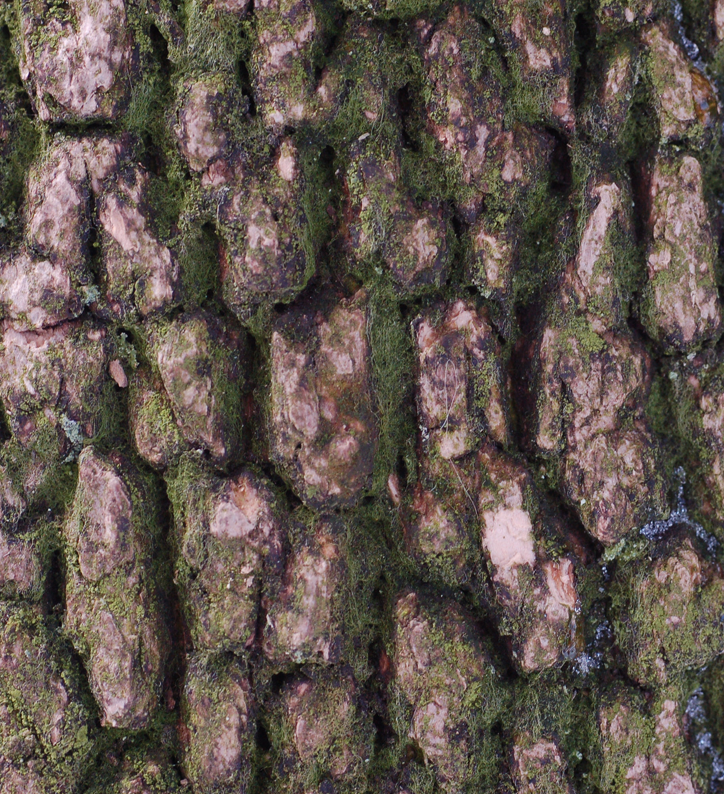 Trunk is 6 inches in diameter covered with a rugged, yellowish-brown and wrinkled bark. Stem is crooked. Branches are erect to spreading, hoary pubescent when young. Leaves are narrowly lanceolate or oblong-elliptic, 1.2-5.5 cm long, 0.5-1.2 cm broad, ovate, entire, smooth, thick, coriaceous and dark green. Leaves are dark glossy green above and yellowish-green below. It has peculiar, rather disagreeable odor and bitter and somewhat astringent taste. 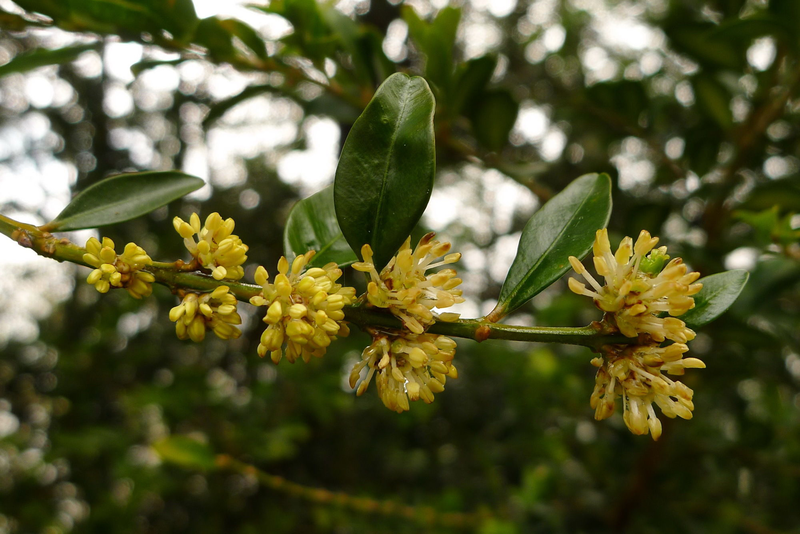 Boxwood plant consists of yellow-green, tiny flowers. It has a female flower in the center surrounded by several male flowers in the same inflorescence. Flowerings normally take place between April and May. 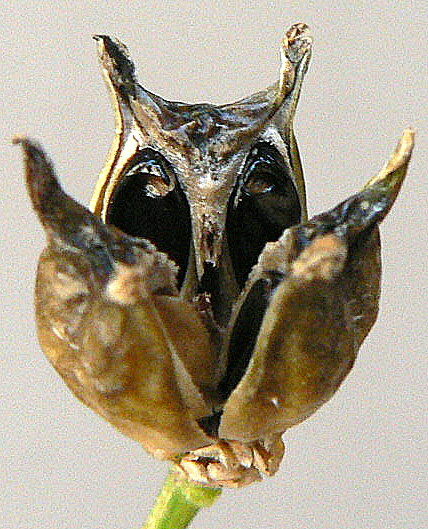 Fruit is capsule trilocular, ovoid-oblong, walnut brown, 8 mm long and 5 mm in diameter, horns are 2 mm long, upright containing several small seeds. Fruit is green when young turning to brown as they mature. Seeds are oblong, 4 mm long and 3 mm wide. The leaves and the bark are alterative, anti-rheumatic, cathartic, cholagogue, diaphoretic, febrifuge, oxytocic and vermifuge. 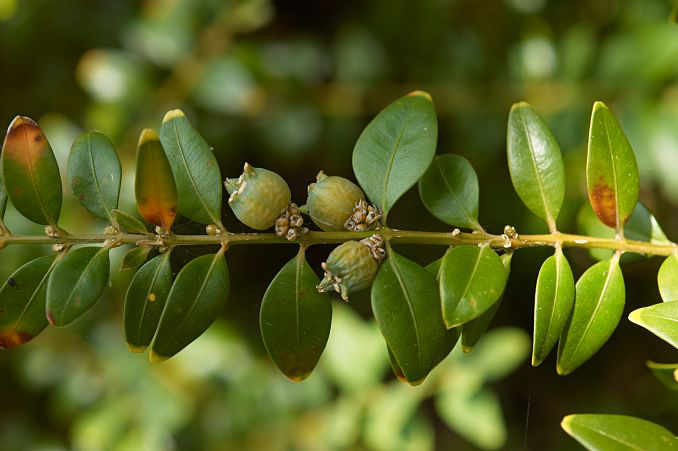 Leaves have been used as a quinine substitute in the treatment of malaria. Tincture of the wood has been used as a bitter tonic and antiperiodic, it has also had a reputation for curing leprosy. Volatile oil distilled from the wood has been recommended in cases of epilepsy. Oil has been used for piles and also for toothache. 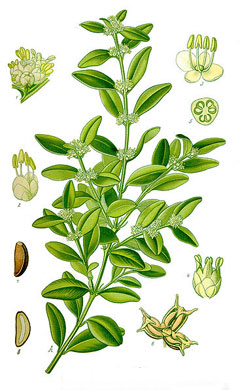 An essential oil obtained from the plant is used in dentistry. A homeopathic remedy is made from the plant. It is extensively used in the treatment of rheumatism. 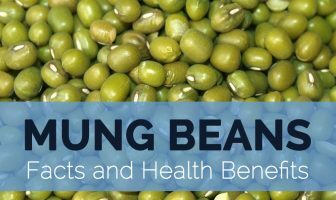 Decoction was suggested by some writers as an application to promote the growth of the hair. In earlier days, Box was the active ingredient in a once-famous remedy for the bite of a mad dog. 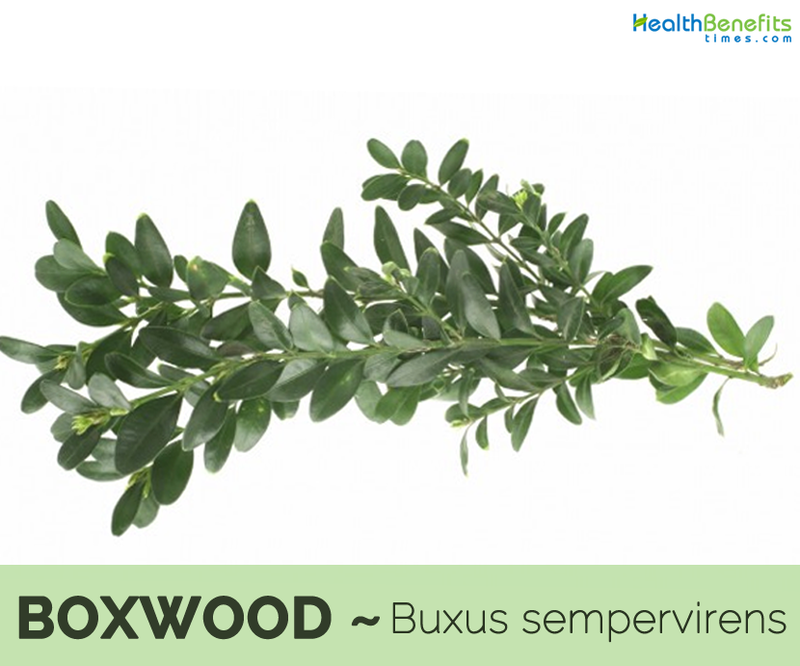 Boxwood was previously used to treat persistent and recurring fever (malaria), gout, rheumatism, urinary tract infections, intestinal worms, chronic skin problems, syphilis and hemorrhoids. Hippocrates, Dioscorides, and Pliny recommend them in diarrhea. The leaves have been used in France as a substitute for hops (Humulus lupulus) in making beer. It is one of the oldest ornamental plants. It is quite slow growing but very tolerant of cutting and is often used in topiary, where the hedge is trimmed into different forms for ornamental effect. The leaves and sawdust, boiled in lye, have been used to dye hair an auburn color. Although the wood is rather small, it is highly valued on account of its hardness – it is twice as hard as oak. It is used for engraving, printing blocks, bowls, combs etc. The root especially is much liked by turners and cabinet makers. 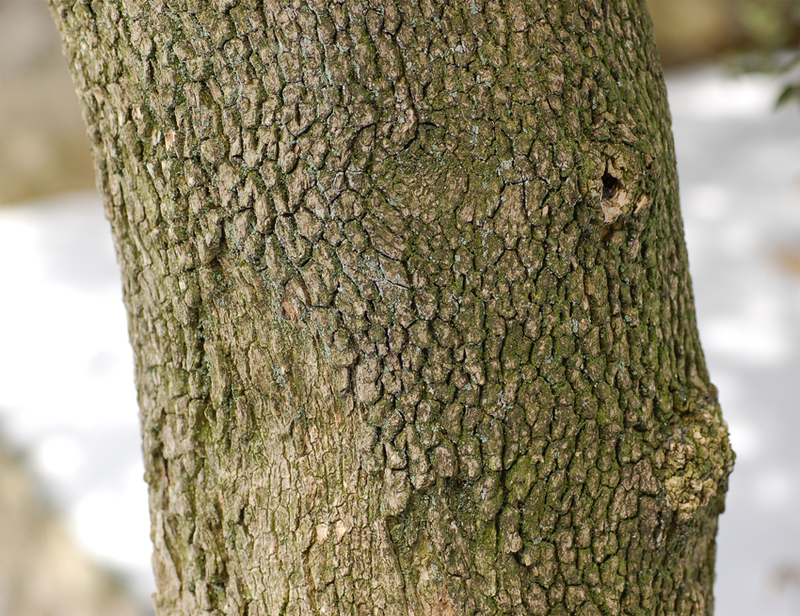 Various extracts and perfumes were formerly made from the leaves and bark. In France, Boxwood has been used as a substitute for hops. Branches and leaves of Box have been recommended as the best manure for the vine, as it is said no plant by its decomposition affords a greater quantity of vegetable manure. Wood has been used to make scientific instruments, furniture, chess pieces, flutes and other musical instruments. On the farm the dried and powdered leaves were used to improve the coats of horses. Some English farmers still use the old-fashioned remedy of using powdered leaves to treat intestinal worms in horses. Box is popular with bees and provides a dense, sheltered habitat for small birds, mammals and insects. All parts of the plant are poisonous, especially the leaves and bark. Use this remedy with caution and preferably only under the supervision of a qualified practitioner. The plant has not been fully tested for its toxic side effects. People are rarely poisoned by boxwood, but to livestock grazing on the plant it can be deadly. Side effects in humans can include abdominal pain, vomiting, bloody diarrhea, tremors, loss of coordination, convulsions and dizziness, and in severe cases coma and death due to respiratory paralysis. Native Open woodlands and rocky hillsides in southern Europe, northern Africa and western Asia. Leaf Narrowly lanceolate or oblong-elliptic, 1.2-5.5 cm long, 0.5-1.2 cm broad, ovate, entire, smooth, thick, coriaceous and dark green. Leaves are dark glossy green above and yellowish-green below. Flower Yellow-green, tiny flowers. It has a female flower in the center surrounded by several male flowers in the same inflorescence. 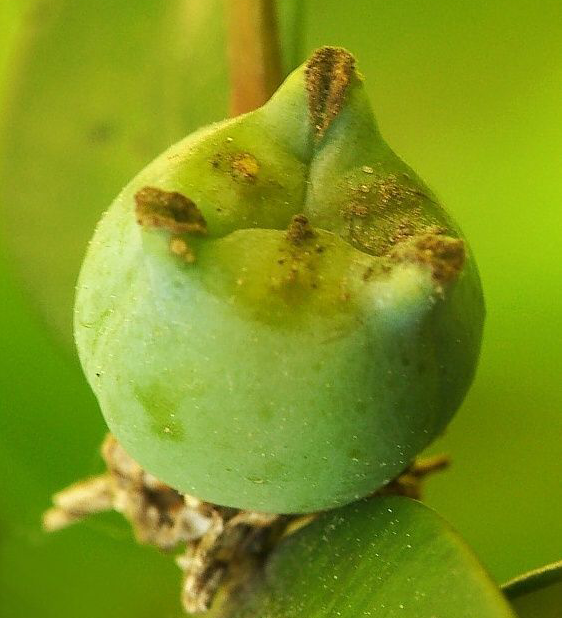 Fruit Shape & Size Capsule trilocular, ovoid-oblong, walnut brown, 8 mm long, 5 mm in diameter, horns 2 mm long, upright containing several small seeds. 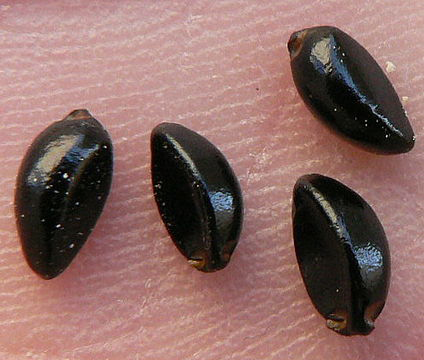 Seed Oblong, 4 mm long, c. 3 mm wide. 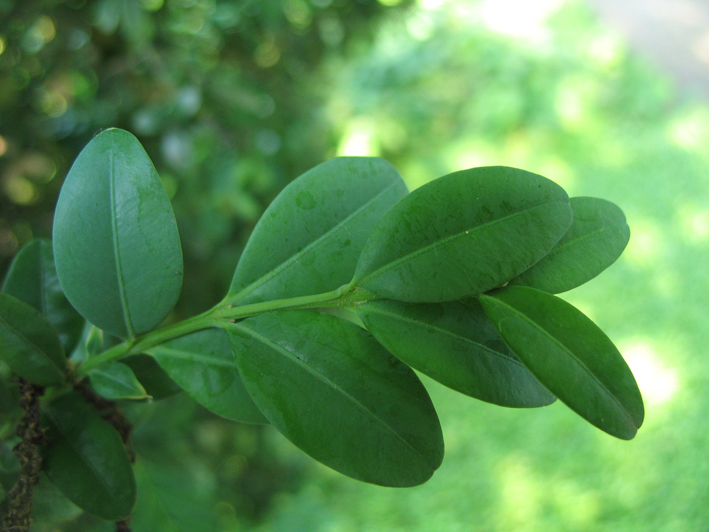 Buxus sempervirens f. myrtifolia (Lam.) C. K. Schneid. Buxus sempervirens subsp. hyrcana (Pojark.) Takht. Buxus sempervirens var. arborescens L.
Buxus sempervirens var. 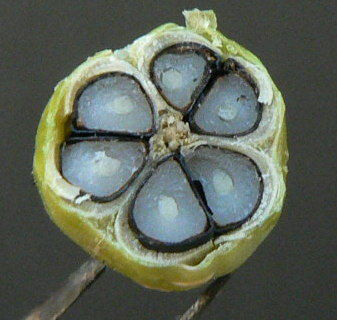 grandifolia Müll.Arg. Buxus sempervirens var. pendula Dallim. Buxus sempervirens var. rosmarinifolium Baill. Buxus sempervirens var. rotundifolia Baill. Buxus sempervirens var. suffruticosa L.